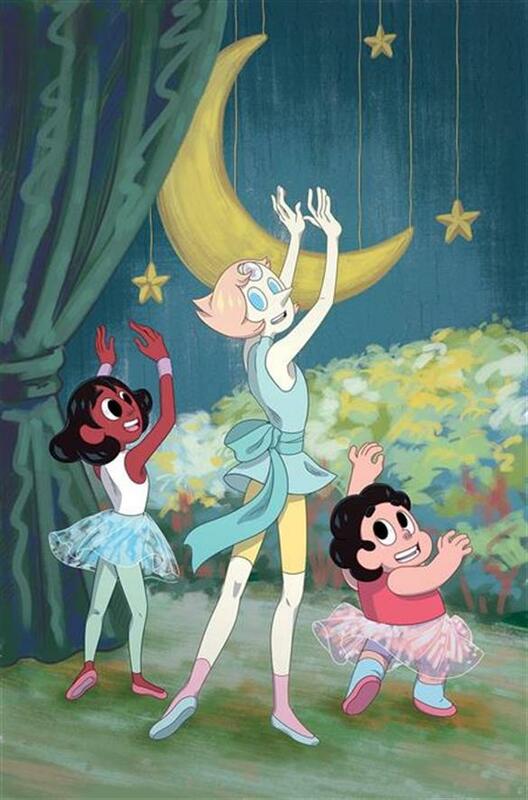 Steven Universe #24, written by Grace Kraft, is the most recent comic from BOOM! Studios’ imprint company KaBOOM! The comic is based on the immensely popular Cartoon Network series, Steven Universe, soon entering its 6th season, about a magical boy named Steven who lives with the powerful Crystal Gems in Beach City. Over the years, the story has become more advanced and incorporated a lot of important issues that affect people today. With the growth in storyline, there was also a growth in its fan following. Many critics and adult viewers found this to be an important series for kids and teens of all ages because of its ideas and messages of creativity. Finding a show that both parents and their kids agree on can be a bit of a rarity, which is another reason why it draws such an audience. Over time, viewers have been introduced to new powers, areas, storylines, and couples. Steven Universe #24 is about main character, Steven and the Gems trying to surprise Steven’s girlfriend, Connie, with a secret garden. It fits seamlessly into the critically acclaimed series and incorporates the same messages and tone that the show represents. One of the things that SU creator, Rebecca Sugar, captures in her show is human emotion displayed through the beings from space, known as Gems, and is one of the main elements expected to be incorporated into any platform on which Steven Universe is read or watched. When making a short side story for such an impactful, popular show, the expectations were not high as far as capturing the same iconic vibe. However, Grace Kraft exceeded expectations and brought us a fun story about teamwork, humor, finding the beauty in darkness, and togetherness. The storyline aligns perfectly with the show, but is easy to follow for those who aren’t familiar with the show. The team at KaBOOM! knocked this one out of the park by creating a story that both fans and newcomers can read and enjoy. Another aspect of the show that fans love is the elegant art style and strong use of color schemes that help carry the mood of each scene. The use of color to convey emotions is something that a lot of artists use in their work, but often overuse or misuse. It takes a lot of skill and planning to execute it properly in a story. I love the art and animation style of show, so I had very high hopes that Rii Abrego and Whitney Cogar would not disappoint, and they did not. For example, there is a scene where everyone wants to give up, except for one person, who has the most contrast in color with the other characters and background. The KaBOOM! team worked together to add to an amazing franchince, and created a simple, yet elegant, comic using a colorful technique to convey the feeling to as a whole. One of the great things about this comic is that unlike a lot of comics today is that this story is short and gets to the point while still having a strong impactful message about finding the light in dark places. The masterminds at KaBOOM! did a fantastic job of incorporating the crucial elements of the series for the dedicated fans of the show, yet still making a easy-to-follow storyline for those who have just been introduced to Steven Universe. This is a great comic for anyone who wants a humorous, fun-loving, story with a greater meaning and message behind it. I look forward to seeing whatever comes next in the Steven Universe franchise!